If you are using Kafka and AWS you probably have something like the following in one of the AWS regions. Multiple availability zones (AZs). One or more Kafka brokers in each AZ. Probably multiple producers sending data to one or more topics in each AZ. Producers in each AZ can select partitions belonging to the brokers in same AZ. Broker rack information and topic partition leaders can be retrieved using metadata request. Producers can narrow down the partition list based on their AZ. With-in the filtered list of partitions, producer can apply one of the partition selection algorithms noted above. For example if there are 120 partitions, ideally brokers in each AZ will be leader for 40 partitions. Producers in AZ will pick one of the 40 partitions and route messages to the partition leader in same AZ. When replication factor is greater than one, messages will still cross AZ boundary. But it will be less data crossing the AZ when compared to non-rack aware partition selection. I patched fork of kafka-node library with rack-aware routing logic. It is a combination of rack based filtering + message key hashcode based partition selection. Numerous enterprises big and small from all verticals are using it, or planning on using it. It is being deployed to production servers as well as employee desktop/laptops. It has first class support for various flavors of Linux and macOS. Windows functionality is maturing, thanks to open source community contributions and Facebook’s efforts. Recently we (Uptycs) started publishing docker images with latest osquery version. We published images for various versions of Ubuntu and CentOS. Ideally running osquery in docker container doesn’t make sense unless you are using CoreOS Container Linux. But if you are just playing with osquery and want to test some functionality docker images are ideal. osquery comes with two binaries. Interactive shell osqueryi and osqueryd daemon. Flags file and the config file are meant to be provided from the host. osquery have extensive number of command line flags. Optionally configuration file can also be provided to the container. Refer to osquery configuration documentation on what can be specified in conf file. If logging is configured, osquery daemon needs to identify itself to the log endpoint. host_identifier with uuid value is not appropriate if you are planning on launching multiple osquery docker instances or if you have osquery running on the host also. Docker containers will end up sharing the same UUID. As I mentioned above osquery in docker only makes sense for playing with osquery or testing it. In real deployments it should be running on the host or virtual machine. In case of CoreOS Container Linux there is no easy way to run any service on the host/virtual machine. On Container Linux osquery can be run inside toolbox which uses systemd-nspawn. I will cover this in separate topic. Figure out where you are going to run the registry. Docker registry is a docker image. It is better to have this EC2 instance in the same region as the S3 bucket. Ideally it should be in a VPC with a S3 endpoint configured. Whether the instance should have Public IP or not depends on where you are going to push/pull the images from! At this point registry should be working and usable but because authentication is not yet setup, you should make sure it is only accessible from trusted hosts. When using spring data mongodb beware of additional count() calls to mongodb. A trivial List<T> find(Predicate, Pageable) call might make two or more round trips to the database. Spring data mongodb/Querydsl could end up calling count(Predicate) to figure out number of entries that match the predicate. I work around this by patching spring data mongodb. Recently we hit production MongoDB (version 3.2.6) issue. MongoDB was reporting lots slow queries. Our application was starting to show performance issues. Some of the slow responses were for covered queries. We had thousands of collections in this database and 10’s of thousands of indices. Most of the collections were collection shards to work-around MMAPv1 collection lock contention. Before we sharded the collections one of them grew very big. 10’s of millions of entries. In this scenarios, depending on applications CRUD pattern, you can hit cache related issues. There are two solutions that worked for me with WiredTiger. Either to evenly balance the sharded collection or to consolidate the sharded collections. This is a refinement to my previous approach. In previous model, there were two VyOS instances in every AWS region. 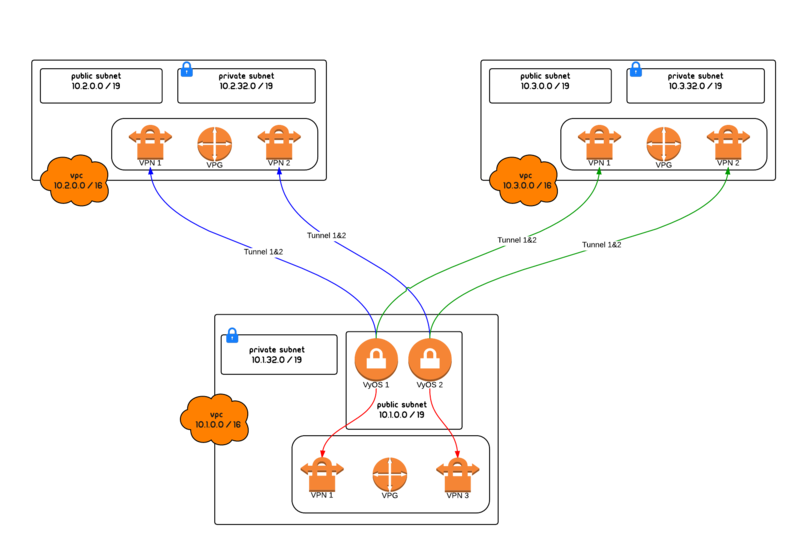 In this model, there are only two VyOS instances in the hub region. All Amazon regions (including the hub region) connect to these VyOS instances. Each line below represents two tunnels. Amazon VPN comes with two tunnels. But both tunnels connect to the same server (VyOS) on the other end. Total cost comes down to (2 * $0.05 per hour * number of regions) + (2 * instance type for VyOS). In our deployment, I chose c3.2xlarge which is $0.42 per hour. For reserved instances that prices comes down to $.020+ cents per instances. For a total of four regions the cost per hour is (2 * 0.05 * 4) + (2 * 0.42) = $1.24 per hour (on demand instances). For 1 year reserved, the cost comes down to roughly $0.90 cents per hour. c3.2xlarge is probably bigger than what we need, but it has high network throughput. Finally, configure the route/network BGP will advertise to the other end (Amazon). For BGP to advertise the route, the route should be in the routing table. Commit the changes and backup the configuration. And keep a copy of the configuration somewhere safe (not on the VyOS instances). At this point, all VPN tunnels in all VPC’s should be green. And they should be receiving exactly 1 route. Modify all the VPC route tables and enable route propagation. All instances should be able to reach other instances irrespective of which VPC they are in. There are 4 tunnels from each VPC to the hub. If one VyOS box dies, traffic will start flowing through the other one. Start ping from an instance in VPC1 to another instance in VPC2. While this is running, reboot VyOS1 instance. You should see minimal disruption. Once the VyOS1 box comes up, reboot VyOS2, traffic should fail over appropriately. Finally modify the security group/NACLs. NTP uses 123/udp (inbound and outbound). IPsec uses 500/udp and ESP/AH IP protocols (inbound and outbound). BGP uses 179/tcp. And of course you want SSH (22/tcp) open as well. You can modify the security group/NACLs by port/protocol. Another option is to whitelist the Amazon VPN tunnel IP address and let all traffic from those IPs.